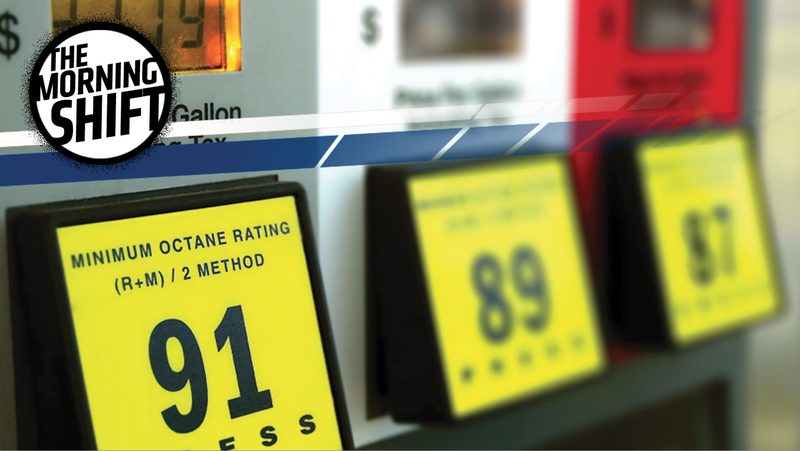 If you’ve got a car whose owner’s manual recommends premium fuel but does not require it, you’re going to want to read the American Automobile Association’s recent study on how premium fuel affects the fuel economy and torque produced by various automobiles. Those automobiles tested at the Automotive Club of Southern California’s Automotive Research Center in LA were the: Ford Mustang GT, Jeep Renegade, Mazda Miata, Cadillac Escalade ESV, Audi A3 and Ford F150 XLT EcoBoost. The study sought to answer three questions: does premium fuel yield improved fuel economy, does premium fuel yield more horsepower and how much more expensive is premium fuel on average? To come up with answers, scientists strapped those six cars to chassis dynamometers, and ran various drive cycles that simulated ever-steeper grades (zero, two, 4 percent at 65 mph and 6 percent at 55 mph) in order to see if the benefits of premium fuel shined through during high-load driving conditions. The team then measured static (at 2,000 rpm and 4,000 rpm) and dynamic horsepower (the engine revs to redline like a normal dyno test) to see how premium fuel affects engine output. Ultimately, the results show that the Escalade with cylinder deactivation functioning and the EcoBoost F-150 (two heavy vehicles powered by small engines) saw the biggest fuel economy benefit when ascending the grades, and the Audi A3 actually started knocking. And as for horsepower readings, increases are mostly moderate, though the EcoBoost F-150 gained 11 horsepower. There is not a clear case where premium gasoline is beneficial from a cost perspective. In most cases, the extra cost of premium over regular does not result in a positive return on investment (lower cost to drive a given distance). However, there are instances – and they vary widely by vehicle type and model – where the use of premium gasoline can be marginally beneficial. If you hear knocking, definitely use premium. If you tow a lot, or do a lot of “spirited driving,” then maybe you should consider premium; AAA recommends that you experiment to find out. Earlier this week, Mini rolled out its new logo, which looks like a more “two dimensional” version of the current one that has been around since the brand was acquired by BMW for its 2001 relaunch. There is an especially striking similarity with the signet introduced for the classic Mini in the mid-1990s﻿...[back in 1990] there was... a return to traditional logo design and a focus on the sporting merits of the classic Mini. A chrome-plated wheel with stylised wings echoed the Morris Mini-Minor logo, but instead of the ox and waves, the red inscription “MINI COOPER” now appeared with a green laurel wreath against a white background. In 1996 this variant was then applied to the other models with a modified background and the inscription “MINI” – the light inscription standing out against a green background. The new “future oriented” look (likely a reference to the brand’s announcement to shift focus to electric vehicles—the new logo was featured on the Mini Electric Concept) will find its way to the hood, rear hatch, steering wheel and key fob of future Minis starting in March, 2018. Yesterday in a former clothing factory in the Corktown district of Detroit, Ford announced at its Holiday media party that it’s turning the 45,000 square-foot building into an office dedicated to the development of electric and autonomous vehicles. The spot on Michigan Avenue just across from the old Tiger’s Stadium will be the new workplace for 220 employees whose focus will be autonomous vehicle and electric vehicle “business and strategy.” Leading the team will be Ford’s vice president of autonomous vehicles and electrification, Sherif Marakby. Executive Chairman Bill Ford talked about how important moving to the area is, since his ancestors moved to the U.S. from County Cork in Ireland (from which the historic district got its name) and because his great grandfather first started the business in the city of Detroit. The move is more than a relocation – it’s a strategic decision aligned with a mission. The company is committed to helping improve the entire system of transporting people and goods, especially in cities facing major challenges such as congestion, pollution, accidents and other transportation issues that affect everything from productivity to quality of life. The Corktown relocation means employees will be working in the heart of these challenges, experiencing life firsthand in one of the nation’s burgeoning urban neighborhoods. I’m not sure Corktown’s quite “facing major challenges such as congestion” or pollution or even high accident rates (it’s not a particularly crowded area), but more auto jobs in Detroit: I can dig it. Ever since the Dieselgate scandal broke in the fall of 2015, Audi has been on the hunt to determine which of its vehicles have emissions-cheating software built in. But now, finally, that hunt is over and the company can dismantle its task force assigned to the job, Automobilwoche reports. We will have documented and processed all the engine/transmission combinations by the end of the first quarter 2018...We are at an estimated 80 percent... We are gradually emerging from the crisis mode and are moving back into regular operation. Early next year, we will turn the diesel issues over to the APS, our committee for product safety, as the central council. It’s been about two years, and only now is Audi “emerging from crisis mode” and dismantling its defeat device-finding task force. What a long two years this must have been for the members on that team. China’s auto market is far more robust than most Americans realize, and between Chinese ownership of major brands like Lotus and Volvo and partnerships with Western automakers like Ford and GM, Chinese-made cars seem all but inevitable in Europe and the U.S. But aside from a few outliers that are already here, when will they hit the mainstream? Geely plans only to sell ‘green’ cars - conventional hybrid, plug-in hybrid and all-electric models - in those markets, and would primarily sell through directly-owned stores and online rather than through traditional dealer franchises. It could also offer cars for rent via a subscription model similar to Netflix (NFLX.O) and Spotify. But one need only look at Tesla’s fight to realize how powerful the car dealer lobby is in America, and that group may not take kindly to innovation. In the United States, selling direct could put Lynk & Co on a collision course with the politically powerful National Automobile Dealers Association (NADA), the lobby group for franchise dealer operators. While [Alain Visser, Senior Vice President of Lynk & Co] says NADA has “unbelievable power”, he believes dealers will eventually come around to Lynk & Co’s retail model as it would likely be franchise dealers who get to service Lynk & Co cars, carrying out repairs and regular maintenance - and that’s where dealers make most money. Online car sales, Chinese cars in the U.S. and more subscription-based sales models seem like they’ll happen eventually. But now, they may happen all at once, whether the dealers like that or not. Neutral: Have You Been Using Recommended Premium Fuel? Do you own a car that recommends but does not require premium? If so, do you spend the extra cash? How will AAA’s study affect your buying habits? Correction: We meant Lotus is owned by a Chinese company, not Land Rover.